Bear Creek Cabins tries to make your vacation as relaxing and care free as possible. Creekside is a truly unique hand-crafted cabin with custom hand-hewn logs, cedar shakes and old barn wood. Inside you will find wood from Wyoming snow fencing, mountain laurel hand railing, West Virginia red oak flooring, and Poplar tree bark. The cabin also offers cathedral ceilings and a 22 ft. wood-burning fireplace to enjoy while you listen to the creek just outside your door. 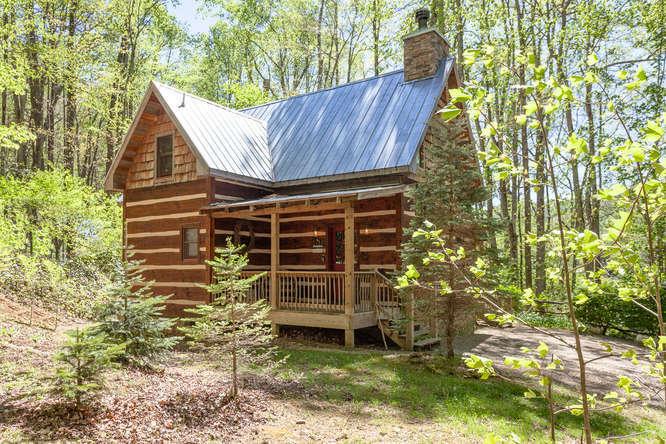 Evergreen is a rustic remodeled cabin built from the Hemlock logs right off of the property. It boasts a stone wood-burning fireplace and a loft bedroom with Virginia Red Oak hardwood floors and French doors that open onto a private deck. This Hot Springs rental cabin has a loft bedroom with French doors that open to one of several decks--with one of the decks hosting your hot tub. Located near the cabins, three pavilions allow for additional locations to relax and take in the beautiful surroundings. Adirondack chairs, picnic tables and other seating can be found in each pavilion, and each has a unique view. Nine acres of gentle rolling land, heavily wooded and situated between two creeks, amidst a serene mountain setting. Enjoy the tranquility from your front porch, private deck, or any of the pavilions located on the property. Fire pit is available for your added pleasure.